I don't think that I have ever read a book that brought me to tears quite like The Boy In The Striped Pyjamas, not even Anne Frank's Diary. Boyne's concept of writing a story about a budding forbidden friendship between the son of a Nazi commander and a Jewish boy in the Auschwitz camp was tragically brilliant. The book was implicit when it came to details and references but you can tell right away what's going on with basic knowledge of the events of the Holocaust. There's a fence separating Bruno and Shmuel and although they only live a couple hundred feet away from each other their worlds are complete opposites. Throughout the book Bruno doesn't fully grasp what's going on, even at the end, his perceives the world as all good and that his father a Nazi commander is also good and wouldn't do anything bad to anyone. Although Bruno was oblivious to what was going on he was constantly telling his best friend Shmuel that they weren't very different which shone a light on the innocence trapped within the monstrous evil surrounding them. The horrific unexpected ending left me in tears, not just because of what happened in the book but because of the horrible truth that these things did happen less than a hundred years ago. The author did a wonderful job to show the innocence and oblivion of children to the world around them. 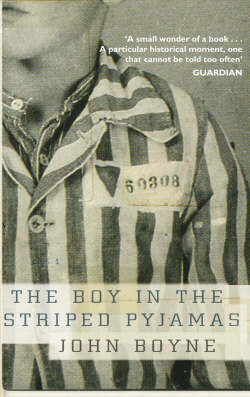 This book really changed my perspective of the Holocaust regarding children and how they must have perceived what was going on. I knew children were victims but I had never really thought in depth what may have been going through their minds on 'either side of the fence'. Completely, tragically beautiful and surely it's a story that I will never forget. After the past two books that I read on my 'to be read' shelf that were extremely deep and tough subjects I'm going to take a break and read light-hearted young adult novels. I watched the movie a couple of months ago and I asbolutely loved it , it totally broke my heart and I've been wanting to read the book ever since .. I'm glad to know you loved it Noellie :). It's a tragic story but the innocence of human nature depicted in it is truly beautiful. Just make sure to keep a tissue box close while you read. :) and thank you Elodie.